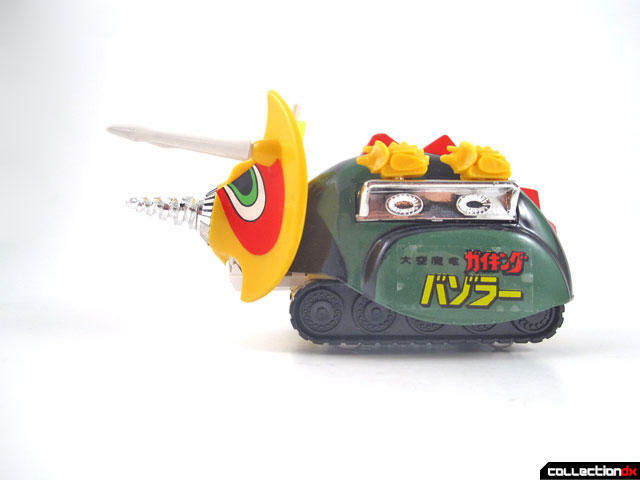 For a variety of reasons, I think Bazoler is one of the more popular Shogun Action Vehicles. 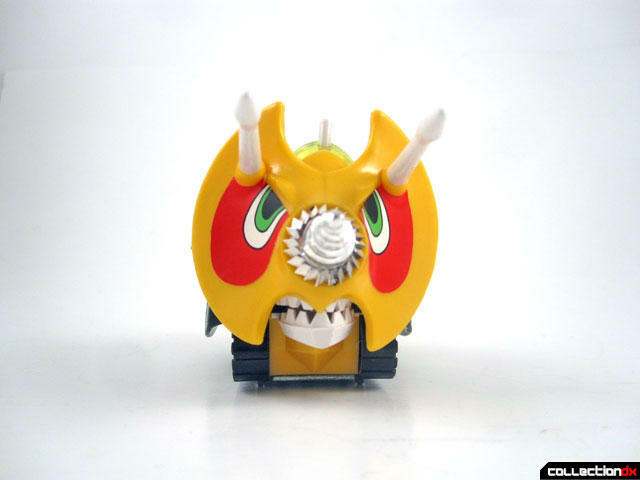 Firstly, it hails from the show "Divine Demon-Dragon Gaiking " which aired here in the United States as part of Jim Terry's Force Five program. The show was quite popular and therefore toys from it would be, too. Also, it's part robot/part dinosaur. Kids usually love dinosaurs and as the Dinobots would later show, they also love them in robot form. As for it's appeal to adult collectors, nostalgia plays a part as well as die-cast content and funk. The entire green and black portion of the body is solid metal as well as the bottom of the body. Although the toy was released in the United States, it still features it's original Japanese name along the side of the toy. This is because it is a straight re-issue of the PA-84 Popinica toy by Popy. Bazoler has 3 different parts that can be launched from the nose by pressing the white tab on top of the head. These parts include a missile, a drill and a horn. One of the funkiest parts of the toy is that it includes several smaller, plastic versions of itself that can be placed along the sides. Perhaps a bit surprisingly, these are not the same ones that come with the Shogun Action Vehicle Kargosaur. Popy/Mattel could probably be forgiven for re-using the same part since they are just about the same size but they are actually two completely different molds. Extra launching pieces or min-Bazolers can be stored in the back of the toy by lifting up the red spikes along the back. The head of the toy can be lifted to open the mouth but it tends to just fall right back down. 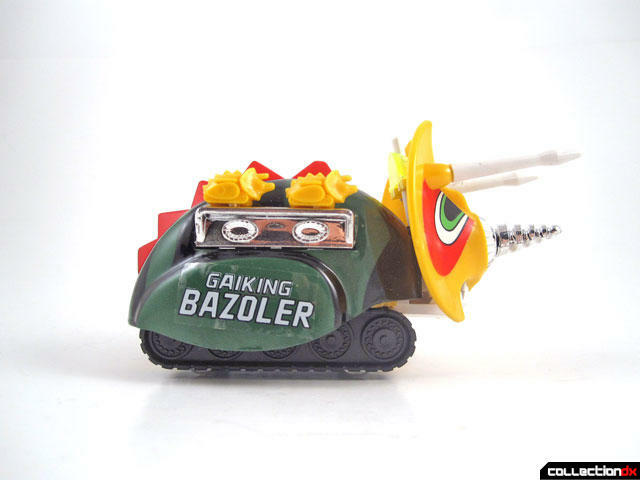 Bazoler is a diminutive toy, being only about 4.5" long. The box is not much better, measuring at only approximately 5.25" x 2.75" x 2.75". The rest of the box is like other Shogun ones, depicting other toys in the line as well as the action features. Of course, Bazoler has it's two companion pieces in Kondar and Nessar and I'll get to those pieces in the next two reviews. Awesome review, Love these designs!